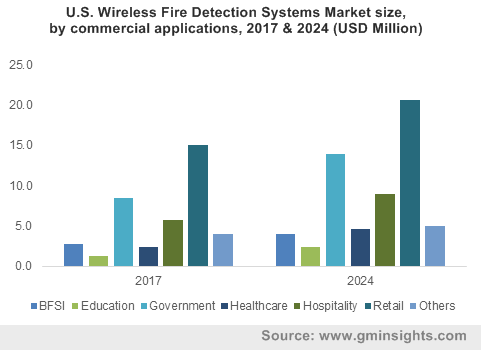 sensor « Global Market Insights, Inc.
Having garnered the reputation of being highly technology-driven, automotive robotics industry thrives on the product innovations brought forth by leading business players. A recent instance citing the validity of the aforementioned declaration is Rimac’s collaboration with Dassault Systèmes. Elaborating further, the September of 2017 saw Rimac Automobili, a key manufacturer of high performance electric vehicles, battery systems, and drivetrains, join forces with Dassault Systèmes, a software firm based in France, to acquire the product lifecycle management digital platform from the latter to scale up its business growth. The latter’s 3D experience platform referred as electro mobility accelerator will help the former increase its production capacity and connect with its employees across 11 countries. This deal is an apt example that underscores the developments prevalent in automotive robotics industry. The continued trend of similar alliances are likely to encourage entrants explore newer markets – the autonomous car sharing market , for instance. Pertaining to the stiff competition prevalent in the automotive robotics market space, companies have been devising a number of business tactics to consolidate their position. In September 2017, for example, Avnet Incorporation, a major participant across information technology and services industry, acquired Dragon innovation, a major producer of consumer electronics products. The acquisition is expected to assist both the firms add to their existing product line and expand their presence in automotive robotics market. The month of September has also witnessed Technion – an Israeli tech institute, Korean Advanced Institute of Science and Technology, and Hyundai Motor Group forming an alliance to jointly complete the projects on artificial intelligence, autonomous driving, and cyber security. The collaboration has been touted to help the emerging automotive firms and startups in Israel to launch their products with Hyundai’s vehicle product line. Vice-versa, the initiative is expected to aid Hyundai Motors establish itself as a leader in automotive robotics market, having experimented with next generation of automotive technologies equipped with artificial intelligence and robotics. The alliance signifies a paradigm shift toward the fourth industrial revolution and new vehicle technology, thereby pushing automotive robotics industry trends. Robotics has established itself as a principal technology across major end-use domains in the developed geographies such as UK, Germany, and Italy. The surging requirement to achieve time consistency and a higher level of production has led to escalating demand for robotic body assemblies in the country. The deployment of these assemblies to improve the proficiency of the supply chain activities across the automotive sector is likely to impel UK automotive robotics industry expansion. Germany has a powerful base of automakers, on the grounds of which it has been forecast that robotic applications would be deployed heavily across the automotive sector in the region. Subject to the extensive implementation of robotics, Germany automotive robotics industry is likely to gain a strong ground in the ensuing years. The expansion of this business space across Germany, UK, and Italy is certain to boost Europe automotive robotics market, which contributed nearly 25% toward the overall industry share in 2016. As per estimates, the demand for robots from vehicle component suppliers increased by 53% in 2016, and that from automotive original equipment manufacturers rose by 32% in the same year. This goes to prove that automotive robotics industry has bright prospects across North America. In fact, research reports claim that North America automotive robotics market is expected to witness a lucrative growth over the coming years, having held a valuation of USD 1 billion in 2016. A currently compiled market study claims that automotive robotics industry revenue is anticipated to surpass USD 5.96 billion by 2024. 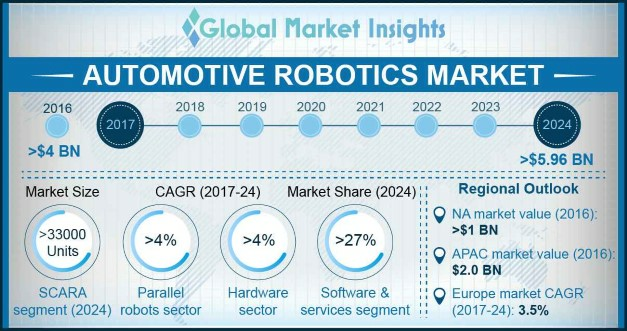 Considering the notable contributions made by the automotive giants such as Rockwell Automation, Omron Corporation, The Yaskawa Electric Corporation, and ABB Group, it is no longer a supposition that automotive robotics market will indeed experience a commendable expansion in the years ahead. This entry was posted in Automotive & Transportation and tagged Arms, Articulated Robot, Assembly, Automotive Robot Market, Automotive Robotics Market, Automotive Robotics Market Size, Cartesian, Controllers, Cylindrical, Dispense, Drive, End Effector, Handling Operations, Paint, Parallel, Processing, Robotics Automotive Industry, SCARA, sensor, Welding.